I’ve questioned before whether it’s still canonical that Mario and Luigi are from Brooklyn, as media related to the games frequently stated prior to Yoshi’s Island, and sometimes still do today. That game apparently puts the kibosh on their having been BORN in Brooklyn, but it’s still possible that they lived there for a while in between the past events of Mario and Luigi: Partners in Time and the first Super Mario Bros. The manuals for Mario Is Missing! and the Super NES Sim City both refer to Mario as being from Brooklyn, as does in-game text in Mario’s Time Machine. It was very prominent in the cartoons and the movie as well. Where you don’t see it is in the main series of games. 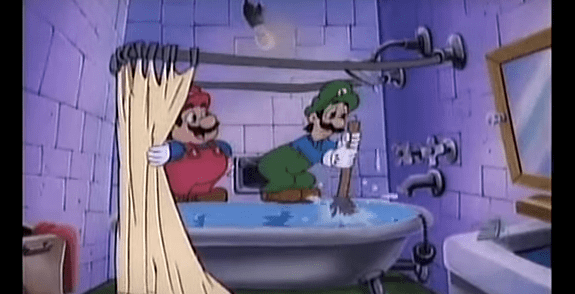 Shigeru Miyamoto has said in interviews that he thought of Mario (and hence Luigi as well) as Italian-American, and Mario Bros. being set in the sewers of New York City. 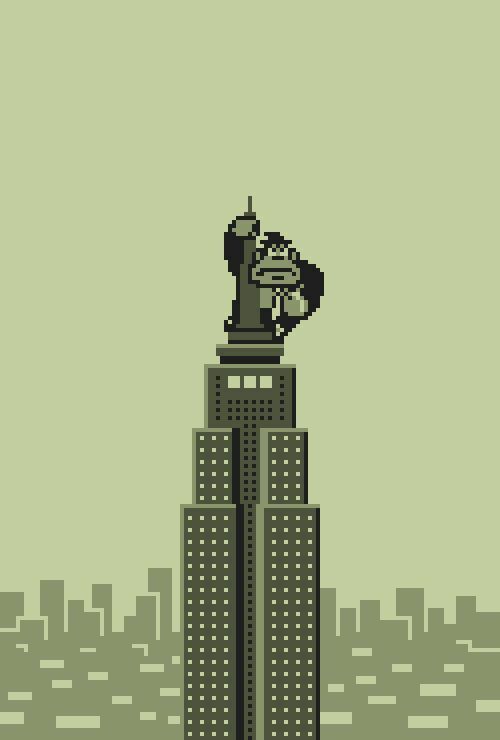 The general presumption seems to be that Donkey Kong takes place there as well, with additional support to this theory being provided by the fact that it’s the city where King Kong went on his rampage, and that the characters and items aren’t that out of place in the real world. Okay, you don’t see too many real people jumping over barrels to rescue a woman from a gorilla, but gorillas and barrels are still things that exist in the real world. There aren’t any size-changing mushrooms or upright turtles here. There is later some doubt cast on that idea by a location in Donkey Kong Land called Big Ape City, however. The page on Super Mario Wiki indicates that a tie-in children’s book and a Nintendo Power article both refer to this city as where Cranky Kong fought Mario, and the instruction booklet for DKL hints at it as well. Then there’s Donkey Kong ’94, as it’s colloquially known (it’s officially just Donkey Kong, but it was released in 1994), in which some of the stages are quite similar to the ones in the original DK game, and at least part of it takes place in the Mushroom World. At least, DK uses mushrooms to grow to an enormous size, and Pauline later gives Mario such a mushroom in a landscape with bricks and a pipe. 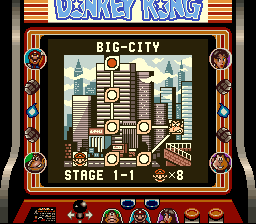 The Big-City world could be the same as Big Ape City, which also suggests that Mario’s first game didn’t take place in New York, but in a similar city on Donkey Kong Island. Or maybe they fought in both places at different times. 1994 was also the year Donkey Kong Country came out, and while DK ’94’s title character does wear a necktie, it doesn’t seem to go along with other game’s idea that Cranky Kong is the original DK and the new one his grandson (or son, according to some sources, but I think the grandson identification is more common). Donkey Kong Jr. is still a kid, not someone who has children of his own. There’s no official timeline for the Mario games (and really, there probably shouldn’t be, although it’s fun to speculate about), but I’m inclined to think DK ’94 actually takes place some years before DKC, if after Mario’s rediscovery of the Mushroom Kingdom in SMB. 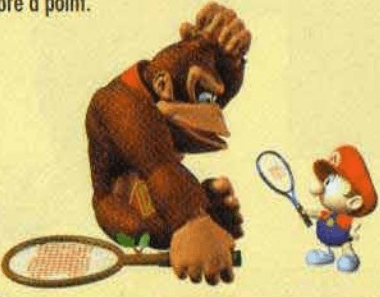 Maybe it’s this rematch in the Mushroom World (assuming, as I generally do, that the DK series locations are there) that Cranky is referring to in DKL and related media. By the way, the children’s book with Big Ape City apparently says that the apes eventually abandoned it in favor of the countryside, allowing the Kremlings to take it over. The trailer for Super Mario Odyssey shows Mario running around a place called New Donk City, where the streets are named after DK characters, but the inhabitants we see are humans (and not ones depicted in the same style as Mario himself, either) rather than apes or crocodiles. We’ll have to wait to see how (and if) this city ties in with the larger mythology. I’ve written before about how weird it is that Donkey Kong Jr. appears to have Mario capturing DK in the jungle AFTER the events of the first game, but it’s also not entirely clear where this jungle is. We do know it has some weird animals that Mario can control to some extent, perhaps suggesting a more fantastic setting than any Earthly jungle. But then, Mario Bros. is established as being set in New York, and it also involves a fight with fantasy-style creatures. Unlike Ratigators, which are perfectly normal in Brooklyn. In hindsight, it’s likely that these monsters were traveling through the pipes from the Mushroom World to ours, but why this is happening isn’t explained. Is it just an accident, or a precursor to an invasion? Did Kamek track down the brothers and send out his minions to capture them? 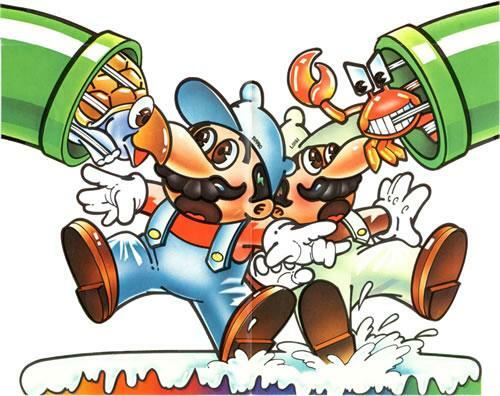 The back story in the cartoons is that Mario and Luigi stumbled into the Mushroom Kingdom by being sucked down in the drain in an old lady’s bathtub, so that fits with the idea that the two worlds are linked by pipes. I’m not sure why the lady herself didn’t end up there, but maybe it was because the Marios already had a link to the magical land due to being born there, although the cartoon’s writers had no way of knowing that (and likely wouldn’t have much cared anyway). But then, a few episodes were based on the idea of people from our world accidentally entering warp zones and the Marios having to help them get back. It’s still possible to fit these events into a larger story of Mario and Luigi being born in the Mushroom Kingdom and interacting with some of the other characters with whom they’d cross paths in the future (Bowser, Kamek, Yoshi, Princess Peach, Wario, and DK), then their parents (or their mother, anyway) taking them (back?) to Brooklyn for some reason and hiding the true story of their heritage, but their returning later on their own. I figure the DK in Yoshi’s Island DS is the future Cranky, which adds an element of tragedy to Mario eventually trapping his childhood friend in a cage, presumably without knowing it. Officially, though, Nintendo might be trying to phase out the New York thing entirely. This entry was posted in Animals, Cartoons, Donkey Kong, Mario, Monsters, Super Mario Bros. Super Show, Television, Video Games and tagged apes, big ape city, brooklyn, cranky kong, crocodiles, donkey kong '94, donkey kong country, donkey kong island, donkey kong jr., donkey kong land, kamek, kremlings, luigi mario, mario and luigi: partners in time, mario bros., mario is missing!, mario's time machine, mushroom kingdom, mushroom world, new donk city, new york city, nintendo power, pauline, shigeru miyamoto, sim city, super mario bros., super mario odyssey, the adventures of super mario bros. 3, yoshi's island, yoshi's island ds. Bookmark the permalink. Think of it this way. This donkey kong we known and love today is the third donkey kong. Since cranky is the original donkey kong, and his son is donkey kong jr. For all we know, baby donkey kong would of been delivered to donkey kong jr. Making Jr become a father to the third donkey kong that we known and love today. It’s not confusing if you think about it. What’s confusing is Pauline being in the picture. It’s possible that there’s 2 Marios. From game theory, he said Mario was delivered by his parents which makes game theory think that the parents are the carpenter Mario (jump man) and Pauline. It’s possible that this Mario we know could be Mario jr. So we got 2 Marios and 3 Donkey kongs. But what I don’t understand is, why the hell is Pauline still young looking later on in super Mario odyssey?!?!??! I haven’t played it, but I think Odyssey makes it clear it was the same Mario and Pauline all along. I’m not sure why they remain young while Cranky ages, though.